The word Midwife comes from a French word meaning "with woman". 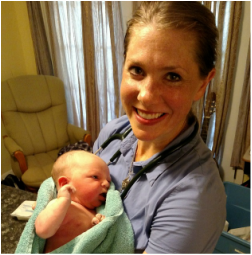 A midwife assists throughout the whole of pregnancy, birth, and postpartum as a diet counselor, obstetrician, friend, advocate and teacher. ﻿What is home birth like? If you are at home giving birth, you are given freedom to choose what position you want to deliver in, what is or is not done to your baby, and who is or is not present for your birth. In addition, you and your baby have the entire attention of your midwife, for as long as you need her. As a rule, how you are treated in a hospital is very different​. In the hospital, you are expected to follow their policies & procedure. At home, you get to set the policy & procedure. In a hospital, the father is “allowed” to be in the delivery room. At home, the father is regarded as a necessary labor support person. In a hospital, if you want to depart from the status quo, you have to fight to do so. At home, your wishes are respected without conflict, as long as safety is not an issue. In a hospital, you are more likely to have a C-section because of liability concerns. At home, if you end up having to go for a C-section, it truly was warranted. With routine doctor/hospital care, the pre- and post-natal care is limited to 15-minute office visits. At home with a midwife, an average visit lasts an hour. Physicians & hospitals focus on TREATING problems. A midwife’s goal is to PREVENT problems. In June of 2005, the British Medical Journal published a study on home births in North America attended by direct-entry midwives (no nursing degree). It was a year-long study that showed outcomes at home to be just as safe as at a hospital, with fewer interventions, and much higher client satisfaction. BMJ 2005; 330: 1416 (18 June): Kenneth C Johnson and Betty- Anne Daviss. Medical News Today, May 9th 2006. ​The BMJ study showed that midwifery care in the US for the year 2000, had an infant mortality rate of 2 per 1000. Of course, this only includes low risk, healthy women & babies. This is the same rate shown in US hospitals for low risk births. Most midwives will charge about the same or slightly less than obstetricians in their area. The midwife’s fee includes the birth, whereas the hospital charge is separate from the doctor’s fee, typically doubling the cost​.